Today, we take a look at and welcome faculty who have started with the Fall Semester. 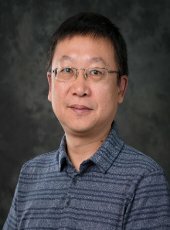 Xiaohu Tang joins Michigan Tech’s Department of Biological Sciences as an assistant professor. Tang earned his PhD from the Department of Molecular and Cell Biology of the Weizmann Institute of Science in Rehovot, Israel. Prior to coming to Tech, Tang worked as a research scholar in the Center for Genomic and Computational Biology at Duke University’s School of Medicine.